Leaving the City of Destruction! In John Bunyan’s earth-shaking allegory, Pilgrim’s Progress, an everyman character named “Christian”, begins a journey away from the City of Destruction (this world) to the Celestial City (Heaven). And in spite of his warnings to his family and fellow town’s-people, Christian ultimately had to make the journey alone. Christian in Pilgrim’s Progress wiki pub dom. Now on this journey, the pilgrim met a character named Mr. Worldly Wiseman, who convinced Chris tian to forsake his heavenward journey, and instead, merely take up residence in the City of Morality. But when Christian saw a giant mountain tottering above the pathway to this city (representing the condemnation of the Law), he realized it was far too dangerous to stay in that town, and risk getting crushed by that heavy mountain! And so, Christian hurried away, and resumed his pilgrimage to the Celestial City. WORLDY WISEMAN, ALIVE AND WELL! Now the point of bringing this up, is that far too many called-to-be-pilgrims today, seem to have met up with this very same notorious and wily character, Mr. Worldly Wiseman! Yes, it seems as though most Christians have been taken in that same deception which almost destroyed Christian! It seems as though many Christians today have the misguided notion that God has called us to make this world our home. And as a result, we encourage our children to get a nice education, and raise a nice family and pursue a nice life here on earth, with nice friends and nice vacations and nice hobbies and nice savings accounts and nice homes and nice cars, and lots of nice possessions, and on and on and on it goes. But what we don’t realize is, that we have quite possibly fallen into the same snare which almost destroyed Bunyan’s pilgrim! Yes, we have most likely been listening to some Worldly Wiseman’s worldly-wise counsel! CALLED TO LEAVE THIS WORLD! But the fact is, that we have been called by God to take up a pilgrimage away from this present City of Destruction, and spiritually climb that upward pathway to the Celestial City of Heaven. And we are called to set aside our carnal and worldly desires and seek to live the same spiritual life which Jesus lived. The same spiritual life that Paul lived! And John lived! And Peter and his family lived! Yes, Paul here calls us to follow his godly example! And though we may have a house to live in, and may even meet our prospective spouse, we should never think that we, as Christians, are to carve out some sort of ivy-covered haven for ourselves, here in this world. No, quite the contrary! We, as Christians, must never plant our roots in this world! And even if we do plan to marry, we must make sure our potential spouse is not merely a worldly-minded “Christian”, mostly seeking after a nice life in this world! But rather, we need to realize that it is God’s purpose to destroy our love for this present selfish world. Ivy Covered Door – Hawthorne Hall – Wikimedia – Creative Commons Attribution-Share Alike 4.0 International license. But instead of nestling ourselves down into this world, the Christian needs to look to Jesus, and follow His example. Listen to the very words of Jesus, when confronted by a potential new follower… “And a certain scribe came, and said unto him, Master, I will follow Thee whithersoever Thou goest. And Jesus saith unto him, The foxes have holes, and the birds of the air have nests; but the Son of man hath not where to lay His head.” Matthew 8:19, 20. Yes, like this man which Jesus spoke these words to, there are far too many of us who think that Christianity is some sort of complimentary addition to our worldly lifestyle. But this mistaken notion is the very essence and foundation of false religion! As this passage reveals, our lifestyle and affections are to be in the heavenly courts above. And though we must still work and provide for needs and happiness of our household, we must, at the same time, keep our main focus on the things of Heaven! TRADING THIS WORLD FOR THE WORLD TO COME! But the Good News is, that though we must forsake our selfish lives in this world, God assures us that we will have “treasure in Heaven”! And part of those treasures are the riches of joy and peace and rich communion with the Lord, as we go through this dark world. And of course, the Bible makes clear that the gift of everlasting life is the truest of all riches! Yes, Everlasting Life! Now that’s true riches!!! 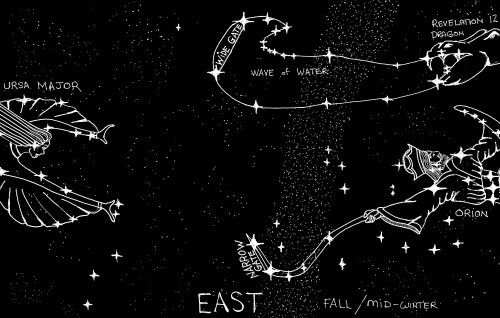 This sketch below is when these constellations are in the eastern sky in early winter (However, this constellation group can even be seen as early as late July, in the pre-dawn hours). 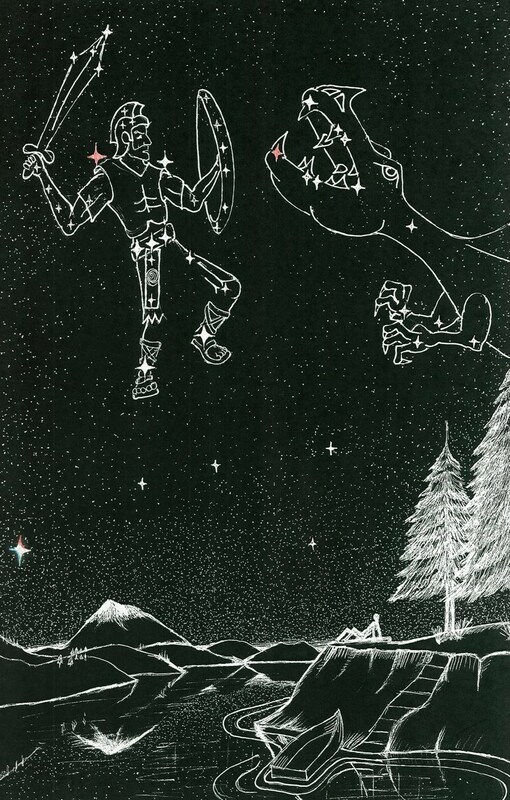 In the eastern sky, it’s not so easily seen which gate the Revelation 12 Woman will enter. The Wide Gate is made of the two brightest stars of this Wave of Water Constellation. Satan spews out the deadly water of his false worldly ideologies; which many of these ideologies have a form of godliness, but in some way are not in harmony; or perhaps these worldly ideologies add to the Bible, which is strictly forbidden (see Deuteronomy 4:2). On the other hand, the Strait Gate (narrow gate) is composed of the two brightest stars of the Orion The Reaper’s sickle. The true Strait Gate represents Jesus, the Word of God.